Dorsal view (A), cerotegument (B), leg II (C) and ventral view (D) of Heterobelba barbata, from Norton & Behan-Pelletier (2009). 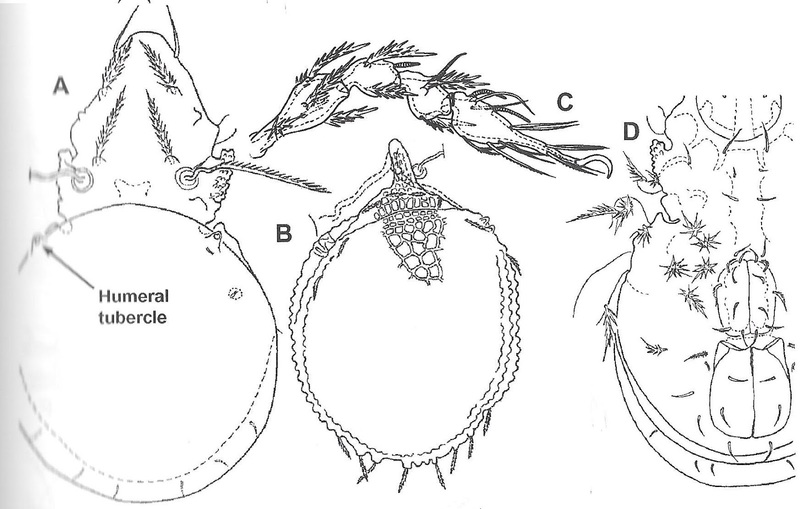 The Heterobelbidae are a mostly pantropical (absent from Australia) group of oribatid mites which carry scalps as adults attached to a pair of humeral tubercles. Characters (from Norton & Behan-Pelletier 2009): Length 300–400 µm. Gnathosoma normal; chelicerae with dentate chelae, two setae; rutella normally developed. Prodorsum without true lamellae. Scalps present, tightly affixed on pair of humeral tubercles at anterior of notogaster; octotaxic systema absent; dorsophragmata and pleurophragmata absent; paired opisthonotal glands opening directly on notogaster. Genital plates with seven pairs of setae. Tibiae and tarsi without porose areas.